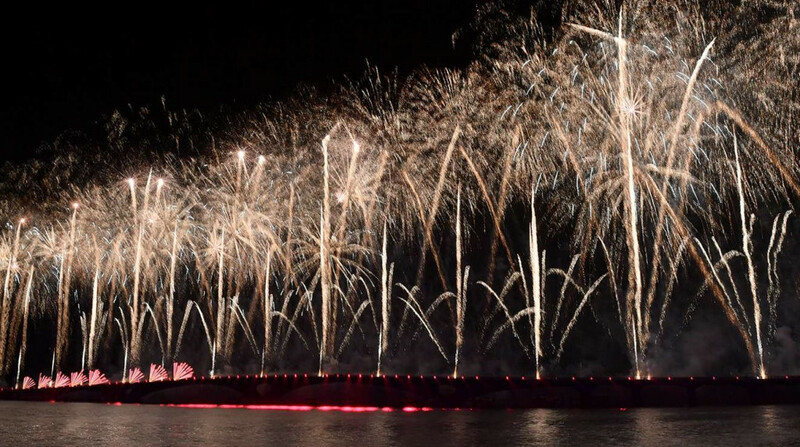 Thousands of people flocked to the eastern end of the capital Male as fireworks lit up the night sky to inaugurate the landmark over-water bridge linking the capital to the reclaimed suburb and the airport island. Incumbent president Abdulla Yameen Abdul Gayoom inaugurated the monumental bridge worth USD150 million mega project, partly funded by China. The colorful ceremony attended by top government officials, foreign dignitaries and the representative of the Chinese government and the head of the International Development Cooperation Agency of China Wang Xiaotao. President Yameen during his speech expressed his sincere gratitude to the Chinese government for making a distant dream a reality. The president said the bridge was a beacon of hope for the youth and stand to revitalize the country's economy. An undeniable engineering marvel, the significance of the monumental project boasting the potential to unlock the country’s economy and become the emphatic answer to mounting social issues sparked by centralization on a massive scale. Government has planned a week long celebration before opening the bridge to the public on September 7.